You ever catch yourself saying things like, “When I was in high school…” or “You kids today…” If you do, here’s a tip —stop!!! You are probably heading for Disappointed Father territory. We do not tend to compare the current generation favorably to the past (nor did our parents!!!). 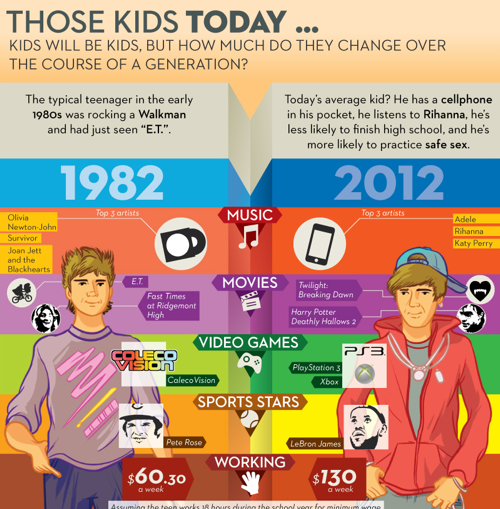 The truth is the world is much different than when most of us were growing up (see graphic). 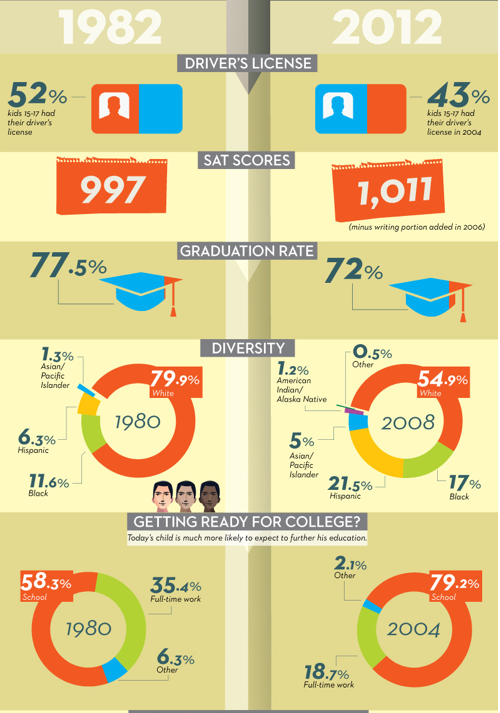 The average high school student encounters 400% more information than just 20 years ago. The choices and possibilites, both good and bad, are incredible in 2012. The increase in information and choices has added significant complexity to parenting. But, here’s the interesting and encouraging thing, kids still need to answer the same questions they did 50 years ago. Three key questions matter for every kid: 1) Who am I? 2) Do I matter (or fit in)? 3) Will I make it? Fathers, we can go a long way to helping our kids answer these questions in a positive manner. Point out your kids strengths and stay with them in difficult times to build resilience. Assist your kids without enabling and encourage them without being fake. Lecturing about how things were in the 1970s or 1980s 0r even 1990s is not super helpful. Everything has changed, yet the most important questions remain the same.